Shira Tarantino is a non-profit professional who has worked in fundraising and development since 1994, specializing in grant writing, strategic development, and cause-marketing. A resident of Stamford, Connecticut, Shira was thrust into the gun violence prevention movement following the Sandy Hook Elementary School shooting in December 2012, when she banded together with 13 other women to form The ENOUGH Campaign, a local civic action organization dedicated to preventing gun violence through legislative advocacy and community education. Shira is a co-organizer of the annual Stamford Vigil of Hope to End Gun Violence, a satellite event for the National Vigil for All Victims of Gun Violence in Washington DC, sponsored by the Newtown Action Alliance. Representing The ENOUGH Campaign, Shira has landed media coverage in the Stamford Advocate, News12 Connecticut, and C-SPAN. A former senior executive at Dress for Success Worldwide, a global non-profit supporting women entering the workforce, as well as the development director at NYC-based homelessness prevention organization Eviction Intervention Services, Shira’s passions include women’s and LGBTQ rights, civic engagement, and religious freedom. She has also respectively supervised phone banks and canvassed for the National Organization for Women-NYC and New York Public Interest Research Group. During the 2014 midterm elections, Shira was a volunteer Tweeter for CT Voters for Gun Safety (​@VoteGunSafety), a non-partisan committee supporting candidates for Connecticut state office who support strong gun safety laws. Aligned with the PAC's efforts, she cultivated more than 1,000 social media followers. Reflecting her spirit, Shira is the founder of Handfastings.org, a network of ordained High Priestesses and Priests, interfaith ministers, and other community leaders experienced in officiating Nature-based handfasting ceremonies (weddings). A free service to those whose spirituality cannot be categorized under traditional religion, it holds more than 150 wedding officiants in five countries who are trained in the art of the ancient handfasting rite, serving thousands of couples around the world. Shira is ordained and can perform weddings in NY and CT.
Shira is currently a freelance development consultant for charitable organizations and full time stay-at-home parent. Prior to her non-profit endeavors, Shira worked in the fashion industry as a wardrobe stylist for editorial shoots and movies in addition to working as a makeup artist. She is a graduate of the Fashion Institute of Technology where she studied advertising and communications along with fashion design. Shira feels creative people make excellent advocates because "we challenge conventional rules and think outside the box." A graduate of the Stamford Parent Leadership Training Institute, Shira was called to study with the Stamford PLTI to deepen her relationship with the Stamford community, promote children's safety, and ignite change for a brighter future. The Stamford Pediatric Gun Safety Project is a natural progression of her work. ​Shira now resides in the Glenbrook neighborhood with her family. 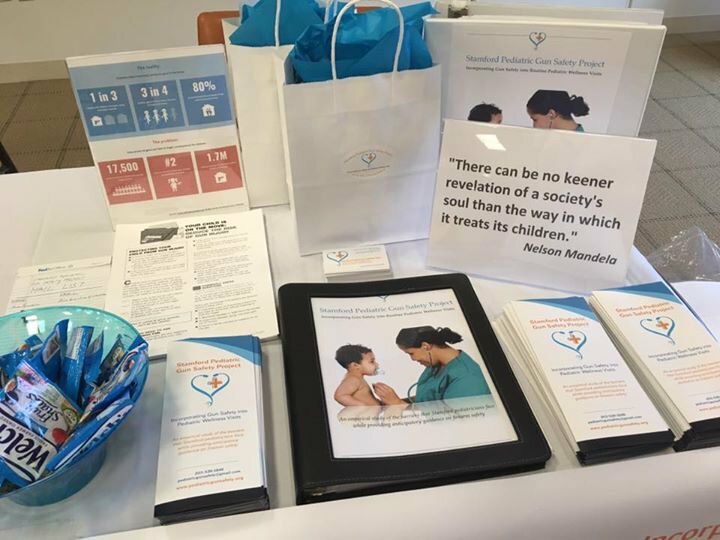 If you are interested in volunteering for, promoting, or advancing the Stamford Pediatric Gun Safety Project, please call Project Director Shira Tarantino at 203-539-1846 or email pediatricgunsafety [at] gmail [dot] com to learn more about how you can help make a difference in the lives of children. Could be you! Contact us.